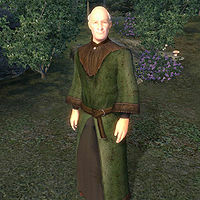 Jesper is a Nord priest added by the Knights of the Nine official plug-in. He can be found at the Shrine of Kynareth in the Great Forest, straight north from Haynote Cave. Jesper spends his entire life enjoying Kynareth's domain, nature itself, where the Shrine is conveniently located. When he is not wandering around talking to his fellow worshippers, Avita Vesnia and Stanet, Jesper spends four hours studying his copy of Gods and Worship on one of the benches, always starting at 10am. While Avita later moves on and becomes a Knight at the Priory of the Nine, Jesper will stay near the Shrine indefinitely. His clothing matches his profession and the surroundings; a green robe and a pair of quilted shoes. He carries his book and nothing else. Before and during the early stages of the quest Nature's Fury, he will not speak about anything but rumors. However, once Avita has pointed you towards the Grove of Trials, Jesper will tell you a bit about the Altar of Kynareth; "It simply wouldn't be right to build over Kynareth's works simply so we could worship her. So our Altar is here, in the Chapel she has created." When you return from the Grove with the Boots of the Crusader, he will comment: "The boots could only be granted to one who values Kynareth's works. It pleases me to see that you are that one."